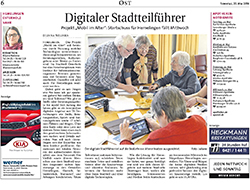 On May 28th, 2018 Stadtteil Kurier has published an article about Mobile Age. On May 20th, 2018 Weser Report published an article about Mobile Age. On May 23rd, 2018 ifib officially launched the digital district guide for Bremen Hemelingen. 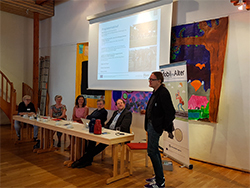 As part of the MobileAge project, ifib partners have been working together with local actors in elderly care and a large number of citizens in Hemelingen since Spring 2017 on the conception and implementation of a digital information service especially for older people. On May 18th 2018 the European Commission published the results of the 2018Digital Economy and Society Index (DESI), a tool which monitors the performance of Member States in digital connectivity, digital skills online activity, the digitisation of businesses and digital public services. The 2018 edition of the eGovernment factsheets has been published by the European Commission's National Interoperability Framework Observatory (NIFO). CEMR​, the Council of European Municipalities and Regions, together with the EU-funded project Smarticipate, organised on 29 May 2018 a workshop on Digital transition meets participatory governance. John Popham, Digital Storyteller, has written an interesting article on the occasion of World Health Innovation Summit Fylde Coast (#WHISFC18) event where he met Mobile Age Project Coordinator, Prof. Niall Hayes, who explains the app developed which aims to overcome social isolation among older people in rural South Cumbria.